She credits her mom for her positive thinking. And Thursday, the mother of seven, former television newswoman, public speaker and author Joan Lunden will be in Beaumont to spread some of her positivity to others. Joan talks about the forward she wrote for Chicken Soup for the Soul: Thanks Mom: 101 Stories of Gratitude, Love and Good Times and her new line called Joan Lunden Home bedding. 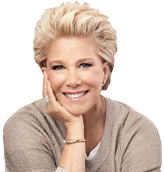 The Joans have a great time on the radio as Lunden talks about the forward she wrote for Chicken Soup for the Soul: Thanks Mom: 101 Stories of Gratitude, Love and Good Times and her new line called Joan Lunden Home bedding to be shown on QVC, May 12 at 11 AM EST. Let Mom escape this Mother's Day. Give her a book. Here are a few she just might be able to relate to: •Thanks Mom: 101 Stories of Gratitude, Love and Good Times (Chicken Soup for the Soul Publishing, $14.95): A collection of stories about moms written by their kids, from best-selling author Brad Meltzer to a 12-year-old. Women make incredible caretakers, but don't always do so well taking care of themselves. That's what Joan Lunden, TV personality, author and entrepreneur believes. And it's one reason why she thrives on being a motivational speaker on wellness and health issues. Veteran television journalist Joan Lunden chuckled when the person who introduced her keynote address at the 21st annual Bakersfield Women's Business Conference mentioned she was a mother of seven, including two sets of twins, ages 5 and 6. Joan Lunden was the key note speaker Thursday focusing on the ten traits of highly successful women. Options unlimited that's how the Bakersfield Women's Conference is described. Joan Lunden, who you probably recognize as the former co-host of Good Morning America, has devoted herself to promoting women's wellness. And, in keeping with her new mission, she'll be hosting a 4-day girl getaway devoted to fitness, healthy eating, and spa treatments. The newly opened Ritz-Carlton Dove Mountain is hosting a girls-getaway with Joan Lunden of "Good Morning,America" on April 15th-18th. Reveille at the Ritz includes three nights lodging, all meals, one spa treatment, and a weekend filled with hiking, yoga, golf instruction, and fitness classes. Joan Lunden, long-time former co-host of ABC's Good Morning America and activist for women's wellness, is hosting a weekend filled with adventure and empowerment for the ladies. Murad, Inc. continues its long standing partnership with Joan Lunden, former Good Morning America host and Murad Resurgence spokesperson, at her newest Girl Getaway, Reveille, a woman's weekend camp founded by Lunden. US TV star Joan Lunden and her camp-owner husband Jeff Konigsberg believe camaraderie and playfulness are just as important to wellness as fitness and spa treatments. Here, they talk about the 'spa camp' concept they created and how they plan to roll it out. Joan Lunden, award-winning television journalist and best-selling author, will be the principal speaker at Lafayette's 175th Commencement on Saturday, May 22, 2010, and will be awarded an honorary degree. While youth might be wasted on the young, I can now say with complete confidence that summer camp certainly is! Jane Capps of Greenville and I attended Joan Lunden's Camp Reveille for women in Naples, Maine, for four days and three nights in August. Joan Lunden, one of America's most recognized and trusted television personalities will return to the ABC Kids Expo in Las Vegas to promote and sell her child safety product, Kinderkord. I want to share an amazing experience I had last weekend. Joan Lunden, former host of Good Morning America, runs a four day summer camp for women in Maine called Camp Reveille. Camp Reveille (www.campreveille.com) is an extremely unique camp experience for women where activities range from jewelry making and ceramics to water skiing and zumba, depending on your personal interests. Joan Lunden oozes with optimism. Sitting with her on a porch deck in Atlanta's trendy Virginia-Highland neighborhood, I could almost literally feel it in the air. This household name in news is now spreading a different sort of message, far from the anchor chair she occupied at ABC for all those years. Southern Maine...How long has it been since you went to summer camp? Bunk houses and mess halls. Swimming in the lake and eating S'mores around the campfire, ghost stories, arts and crafts or just hanging talking with an old, or new best friend.